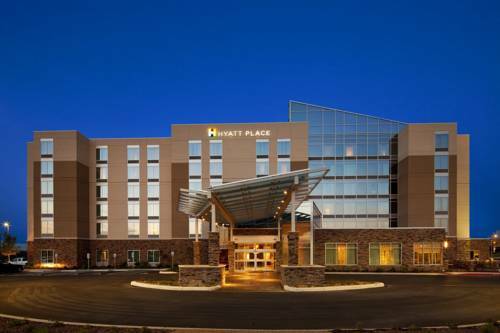 Hyatt Place is an exciting and innovative select service hotel offering more of what is important to today's travelers. Our guests enjoy a spacious guestroom with a 42 inch high-definition flat panel TV, our signature Hyatt Grand Bed, a plush Cozy Corner oversized sofa sleeper that is separated from the sleeping area, and complimentary high-speed Wi-Fi internet access throughout the hotel. Guests at Hyatt Place will also enjoy a complimentary a.m. Kitchen Skillet, featuring freshly prepared breakfast sandwiches, waffles, French toast, pancakes and steel cut oatmeal, available daily and can purchase freshly prepared menu items, premium espresso drinks, or beer and wine 24 hours a day. Pet Policy - 1-6 nights a 75 non-refundable fee. 7-30 nights a 75 non-refundable plus a 100. cleaning fee will be administered -inclusive of taxes. Max. 2 pets per room. Weight limit is 50 lbs or less for 1 pet or max. 75 lbs for 2 pets. Fees are in USD. Service Animals are exempt from fees. North San Antonio/Stone Oak Area. Located in the heart of San Antonio, Hyatt Place is the gateway to Stone Oak, Santerra, Canyon Springs, Hill Country, and Hollywood Park. Our central location puts us only a few miles from any of San Antonio's top tourist attractions. Cancel by 3pm Hotel Time 24 Hours Prior to Arrival.